ArcGIS provides a rich set of functions for different symbolization styles. Automated text placement and labeling are 90 percent faster, helping update the atlas in record time. GIS allows automation, storage, editing, and management of spatial data in one place. Maps in the new edition of the atlas retain the highly distinctive and widely respected Times style. John Bartholomew set up as a map engraver in Edinburgh, Scotland, in 1826, and William Collins published his first atlas in 1856. John Bartholomew & Son was incorporated in 1919 and was subsequently acquired by Reader's Digest in 1980, then by News Corporation in 1985. It merged with Collins Publishers (UK) and Harper & Row (USA) in 1989 to become part of HarperCollins Publishers. Today, the Collins Geo division of HarperCollins still trades under the name Collins Bartholomew. 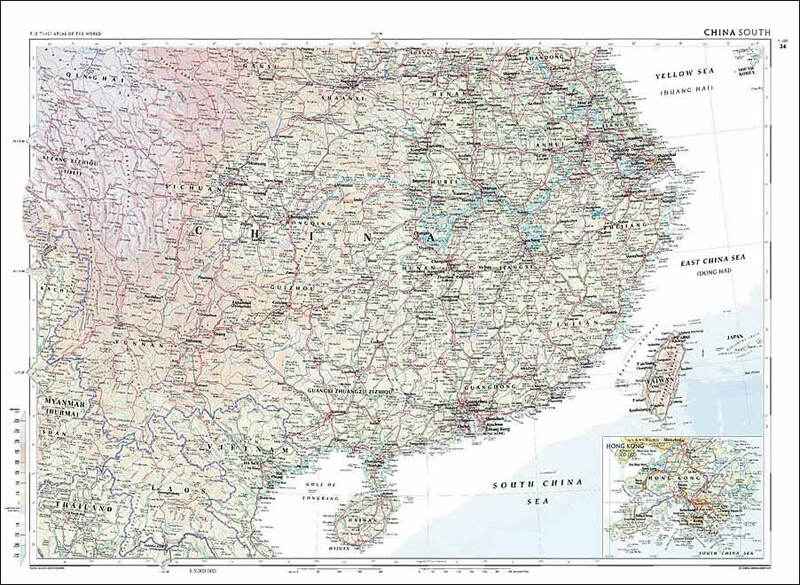 As well as being one of the world's leading cartographic publisherspublishing atlases and maps under its own Times and Collins brandsthe company is a leading provider of map products and geographic data to other publishers and commercial organizations and agencies throughout the world. Today employing more than 50 cartographers at its Glasgow, Scotland, and Cheltenham, England, offices, Collins Bartholomew is dedicated to providing the most accurate and up-to-date maps available. Following John Bartholomew's foundation of the engraving company, the Bartholomew mapmaking dynasty lasted for more than 150 years. It included John George Bartholomew, royal cartographer to King George V, who was one of the protagonists of geographic education in Scotland and a founding member of the Royal Scottish Geographical Society. In 1922, John George's son John completed the Times Survey Atlas begun by his father, and the company went on to produce a long line of universally acclaimed world atlases, culminating in The Times Atlas of the World, Mid-Century Edition, published in five volumes between 1955 and 1960, which set the standard for world atlas publishing. In 1967, it was reworked into a single volume as The Times Comprehensive Atlas of the World, which continues to be the world's leading reference atlas. The 12th edition of this atlas has just been published. From its inception, Collins Bartholomew has used the most technologically advanced tools to create its paper maps and atlases, even back in the 1800s when this meant relying on the finest engraving tools, ink, and pens available. Since the 1980s, the company has relied on computerized mapmaking using GIS software, seeing significant improvements in costs and production methods. 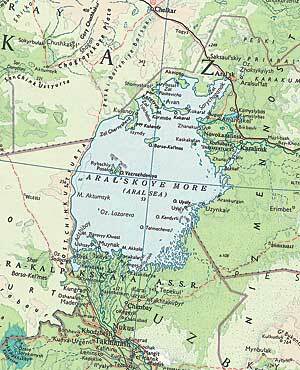 The Aral Sea in central Asia has shrunk dramatically as a result of the extraction of water from the rivers that feed it and changing climatic conditions. 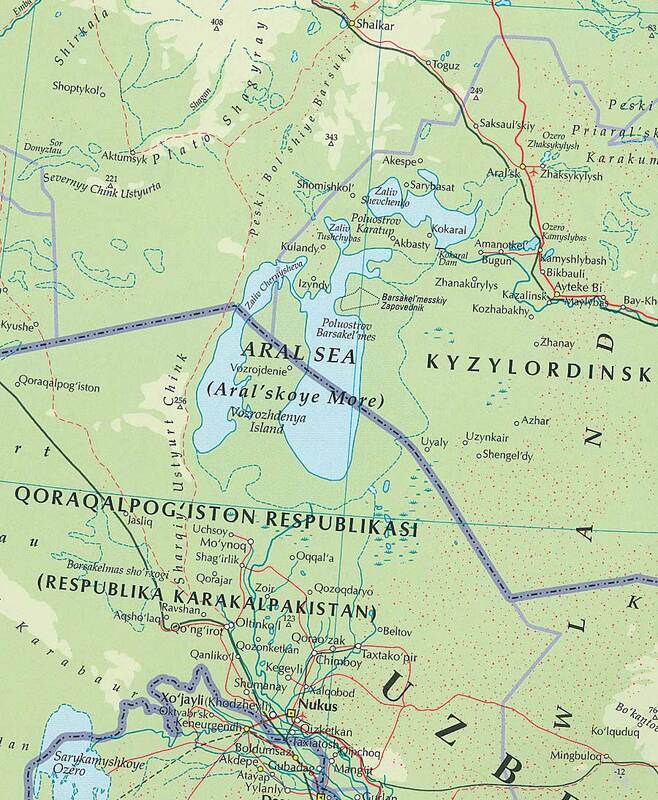 The extent of the change is evident through a comparison of maps from the Times Atlas of 1967 and the new 2007 edition (shown below). 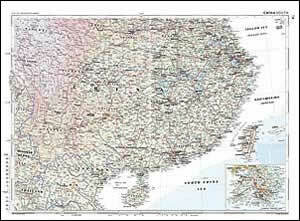 A driving force behind the company's move to GIS was the need to update The Times Comprehensive Atlas of the World. The atlas needed to be constantly maintained and brought up-to-date to reflect physical changes of the earth, as well as to present a balanced view of the geopolitical landscape. To update this all-encompassing book in a timely manner, Collins Bartholomew knew it needed to find the most appropriate software. After researching available technology solutions, Collins Bartholomew purchased ArcGIS and Maplex for its cartographic needs. This solution allows Collins Bartholomew to automate, store, edit, and manage all of its spatial data in one solution, stored in an Oracle database running on a Windows 2000 network with large-format HP Designjet plotters for hard-copy output. ArcGIS facilitates production of many valuable analytical and cartographic products more efficiently than the company was able to before. Data stored in the geodatabase can be versioned, allowing multiple users to carry out simultaneous updates, including long transactions. This prevents unnecessary locking of data layers or creating superfluous copies of data. "With versioning, it is easier to create cartographic product generation and map finishing, meeting publishing deadlines while continuing in parallel with ongoing database updates," says Sheena Barclay, executive director, Collins Bartholomew. ArcSDE technology, a component of ArcGIS, provides access to the geodatabase, operating as the gateway facilitating spatial data in a database management system, providing efficient storage of continuous map data with spatial searches and transaction locking. By using a database-centered approach, Collins Bartholomew was able to update the atlas in record time. Having the data available for selection, classification, and extraction depending on the map scale or theme has made the job more efficient. Barclay explains, "The database needs to be as flexible as possible in terms of what features are contained, how features can be symbolized, and more. Now we are able to use the data any way we need it quickly and easily. We are saving a lot of time, and time is money." After the data is updated and edited in the geodatabase, cartographers use Maplex labeling software for text placement. Once a time-consuming and laborious process, labeling tasks are now automated, and Collins Bartholomew has found it is completing this part of the mapmaking effort 90 percent faster. 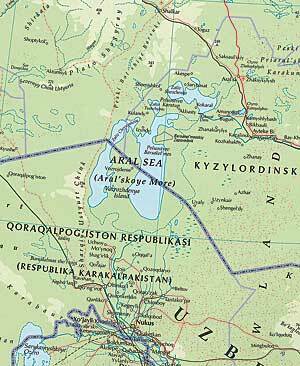 The Times Comprehensive Atlas of the World epitomizes the beauty and power of GIS software. Painstakingly researched by a dedicated team of more than 50 cartographers, the atlas is fully up-to-date, stylish, and contemporary, continuing to be the leading authority with its selection of detailed maps and index of more than 200,000 places and features. The effort put into this publication was momentous, with changes to the database made on average every 3.5 minutes using a 24-hour-a-day feed. The changes were validated by information from approximately 500 organizations and experts. New maps and geographic publications from government departments, official agencies, business offices, and individual experts around the world provide information for all the world's countries on a variety of topics. 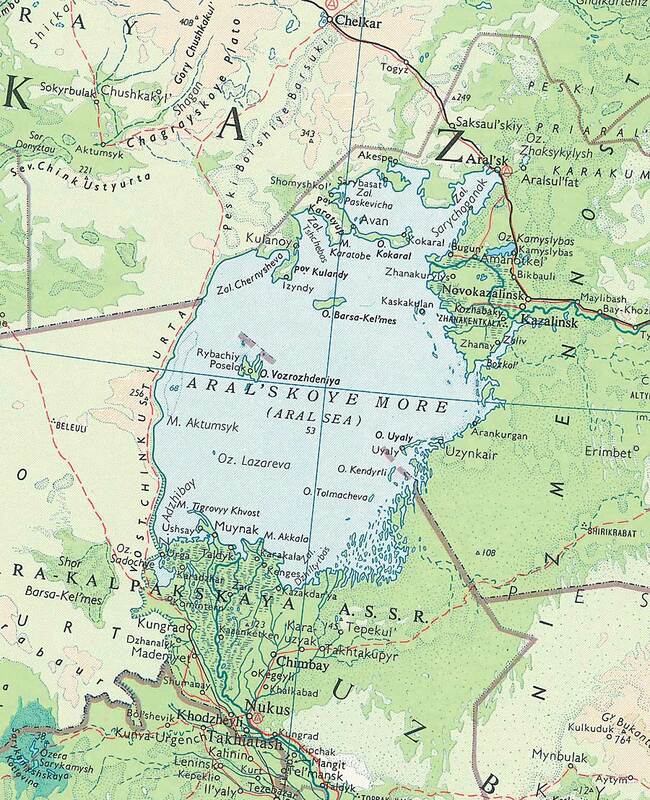 The Times atlas team is careful to validate spelling and attribution of place-names and the depiction of disputed boundaries, a contentious undertaking. Taking care to present the information accurately, impartially, and in as neutral a way as possible, a policy committee meets regularly to decide the correct spelling of names and the introduction of new forms. New and disputed international and administrative boundaries are scrutinized and the best way of portraying them decided. The committee also determines policies relating to preferred sources and their use for specific geographic informationin particular, geographic statistics, flags, currencies, languages, and religions. Crucially, it decides how any policies should then be applied to the atlas, the databases, and other products and disseminates its decisions to all interested parties, offering guidance as necessary. The data for the new edition of the atlas, published in September 2007, reveals much interesting information on climate change and its effects on the earth, the urbanization of world population, environmental changes, and the dramatic growth of China. Using ArcGIS, Collins Bartholomew produced the atlas in less than 12 months. This, in turn, gave it the flexibility to create new and innovative data offerings, expanding its overall product line to more than 200 products, with incremental revenue from the new products amounting to more than US$5 million. Data products include digital maps of the world, Great Britain, Europe, London, and more, with an extensive authoritative gazetteer of more than 800,000 names. Atlas data includes detailed administrative coverage, lakes and other bodies of water, topography, urban areas, roads, parks, and rail and ferry locations. "We have used GIS to increase throughput and to lower the cost of map production," says Barclay. "Equally important, we now have a more creative and flexible range of products. We can use GIS to target specific needs and produce solutions based on those needs. New markets are opening up for geographic information. Collins Bartholomew is positioned to capitalize on these new opportunities." Now Collins Bartholomew is able to use Esri software for virtually every step of production. This data-centered approach has revolutionized Collins Bartholomew's workflow. For more information, contact Jim Irvine, head of Digitial Resources, Collins Geo (e-mail: jim.irvine@harpercollins.co.uk), or Mick Ashworth, editor-in-chief, World Atlases, Collins Geo (e-mail: mick.ashworth@harpercollins.co.uk). 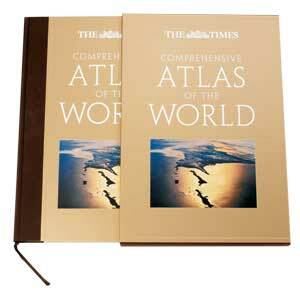 The Times Comprehensive Atlas of the World, 12th Edition, published by Times Books, September 2007, hardback with slipcase. Available in the United Kingdom as of this writing. ISBN 978-0-00-723670-1.